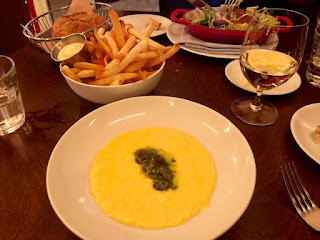 When I read the Best of 2018 lists this year, there was one place that appeared in almost every article, Frenchette; a lively little French bistro on the edge of Tribeca. Chef Riad Nasr and Chef Lee Hanson are in the kitchen; a dynamic duo who opened the kitchen of Balthazar together back in 1997. The space exudes a mix of characteristics similar to city's classic French spots; the bright, clean elegance of Balthazar and the cool, bar vibe of Raouls; but it's also decidedly different with a small, simple menu and a casual, laid back style of service. On the weekend lunch menu a rich, smoky Duck Confit served atop a bounty of root vegetables perfect for soaking up all the juicy drippings from the bird. A beautiful Brouillade studded with garlic Peconic escargot; a dish that truly showcases the French lust for butter. ...and a scoop of creamy Salted Caramel Ice Cream for dessert. C'est Magnifique! New Brew Friday- Happy 5th Anniversary to Other Half! It's so crazy to think that five long years have passed since Other Half opened up its doors in Brooklyn. Mr. T and I had been lamenting the nonexistent beer scene in NYC and then that tiny little tasting room opened up and voila, IPA's for everyone! Of course it wasn't that perfect. The tasting room was so small only one table fit inside and a single fan spun slowly in the corner, almost mocking us with its false attempt of respite from the scorching hot weather. But today the tap room is much bigger, release lines much more manageable and although I miss the single hop series that kicked off their fame, it's really great to have such an awesome brewery in the city. Cheers to Other Half's Anniversary and New Brew Friday! Hidden on the edge of the Financial District sits Temple Court; Tom Colicchio's lesser known restaurant inside the stunning Beekman Hotel. This sleek little spot specializes in classic American food using the freshest possible ingredients in season. I wanted to order just about everything on the RW Menu. There was creamy Burrata with heirloom squash and pesto, Mussels steamed with saffron and Gnudi with shaved Brussels sprout, Granny Smith apples and sage. 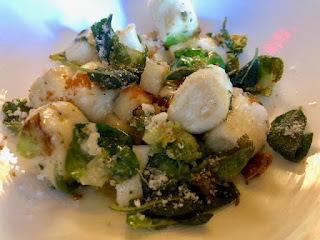 To be quite honest, if a dish mentions both sage and brown butter, I'm almost always going to order it and these little pockets of cheesy potato Gnudi were the perfect vessel for that explosive flavor combination. Onto entrees a beautiful Skate Meuniere dressed with lemon, capers and a trio of roasted cauliflower. Both dishes showing classic preparation of protein and winter produce executed to perfection. Restaurant Week which ends in a few days, so make those lunch/dinner plans now before time runs out. As the Polar Vortex continues to unleash freezing temps across the city, we search for more warmth in comfort food like the Velvety Tomato Soup & Adult Grilled Cheese from Sarabeth's on Park Avenue South. Adult here really just means excessive; as in excessive amounts of glorious melted cheddar, Manchego and Gruyere cheese all sandwiched between a buttery Bavarian pretzel roll dusted with salt. 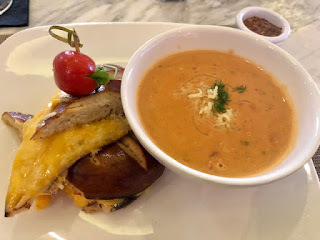 This sandwich has enough cheesy goodness to provide comfort for days, especially when dunked properly into the Velvety Cream of Tomato Soup. This thick, creamy broth is chock full of chopped shallots, chunky tomato and even more cheddar cheese shredded on top making this the ultimate soup and sandwich comfort combo.